Pianist Amanda Horn Gunderson ('06 B.M., '06 M.A., '08 M.M. piano performance) and violinist Emily Karosas ('13 B.M., '15 M.M. violin performance) have joined together with cellist Andrew Rammon to create a new chamber music ensemble sponsored by Lycoming College. 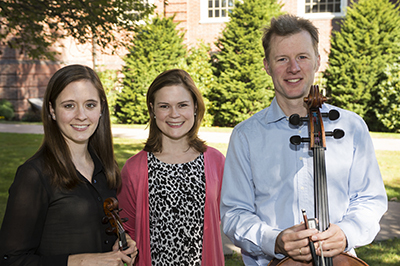 The Lycoming College Piano Trio will present its inaugural performance on Saturday, Oct. 10 at 8 p.m. in the Mary Lindsay Welch Honor Hall on the campus located in Williamsport, PA. The program includes Beethoven’s Trio in D Major, Op. 70, No. 1 (“Ghost”) and Shostakovich’s Trio No. 2 in E Minor, Op. 67. Amanda Gunderson teaches courses in applied piano, music theory, and music appreciation at Lycoming College. As a soloist, she has performed throughout the midwest and mid-atlantic, including an appearance at Weill Recital Hall at Carnegie Hall. As a chamber musician, she serves as co-founder of Duo Mendota, with violinist Carol Carlson, and as pianist in the Lycoming College Piano Trio. She received her doctorate from the University of Wisconsin-Madison, where she won the Irving Shain Duo Competition and earned an Emerging Interfaces Award for her research on injury prevention with small-handed pianists. While a piano student at Penn State, Amanda was a student of Timothy Shafer. Emily Karosas maintains a full studio at the State College Suzuki program and serves as an adjunct faculty member at Lycoming College and Juniata College. She is currently a member of the Pennsylvania Centre Orchestra, frequently plays with the Williamsport Symphony Orchestra, and performs yearly with the Music at Penn’s Woods Summer Festival Orchestra. Karosas won the 2015 Music Teachers National Association (MTNA) Young Artists Competition, and also recently performed the first movement of the Barber Violin Concerto with the Penn State Philharmonic Orchestra as a winner of the 2015 Concerto Competition. She has performed in concert with Boyz II Men and the Paragon Ragtime Orchestra, and can be heard on recordings by Japanese instrumental rock band Mono and Christian folk group Aaron and Ashley. Emily was a violin student of Penn State professor James Lyon. Rammon teaches cello and string methods courses. He is currently cellist of the Grammy-nominated Eaken Piano Trio and has performed as soloist, and in chamber ensembles, across the U.S., Europe, Russia, China and Japan. Rammon also serves as an adjunct faculty member at Susquehanna University and is the principal cellist of the Williamsport Symphony Orchestra. Earlier this year, he participated in a chamber music performance with the Fitzwilliam String Quartet. He holds a bachelor's degree from Pepperdine University (CA) and a master's degree from the Cleveland Institute of Music.